What is it about good workmanship that leaves us more fulfilled? Whether as the one producing or the one appreciating the quality of the work, there is something more to be said for work that is the product of commitment, discipline and care, rather than that of someone going through the motions. Work done for the sake of doing work well is deeply satisfying, sating the soul. It motivates itself, disciplines itself and is deeply rooted in the specific realities, the details and quirks of the materials and context rather than the abstract ideals of “best practice” or preordained, check-list style procedures. 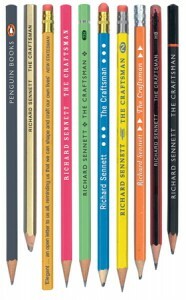 Richard Sennett dwells on these themes in The Craftsman. The book is a meditation on skill, expertise and quality of work through an exploration of their facets and context, historical and modern. An avowed pragmatist philosopher, he eschews the arid abstraction of a conceptual analysis in favour of a richer, textured examination of these ideas embedded in an often historical narrative. He lays out the topic of interest through a contrast of Soviet-era construction work – frequently shoddy products of people who were treated little better than prison work-gangs – with modern open source computer programmers, who give work-years of their spare time voluntarily in order to produce quality software for the enjoyment of producing something genuinely worthwhile. It is this distinction that occupies Sennett – between work done for its own sake and work done for the sake of getting it out of the way, the one organic, situated and committed, the other mechanical, abstract and care-less (and thus so often careless). Sennett examines the facets of the urge to quality from a number of different angles – from the historical relationship between masters and apprentices (by which hands-on practice the inarticulable habits of the master could be passed along), the broader relationship between craftsmen, their guilds and society, and then into the particulars of the skilful activity itself, so rich in narrative and detail as it tends to be. Continually present in the work is Sennett’s appreciation of the transformation of experience that the development of skill entails. Finding adequate means of describing and expressing the changes in consciousness that craftsmanship involves is a daunting task, and there are times when Sennett’s discussion doesn’t quite achieve what he is aiming for. Nevertheless, his fundamental understanding of the experience of learning, of teaching and of expertise suffuses the book. His discussion of the callused hands of the medieval goldsmith I found particularly compelling, as he described the ways in which those hands with their hard-earned hardened skill would probe and squeeze the crumbled ore in the process of assaying, and whose sense of touch was (surprisingly, ironically) improved by the toughened skin because of the rich, interwoven set of activities in which it had developed. His discussion of good teaching shows a similar sensitivity, noting how the abstract presentation of best practice is meaningless without being grounded in the realities of the student’s own experience, both the experience they to date and the (particular, bodily, visceral) experience they will have in the process of interacting with their materials. It is this not just individual but personal nature of expertise that shines through most clearly in Sennett’s explorations. Skill is not something generic, but is particular to the expert, and exists in the relationship between then and their work – both the process and the product. Craftsmanship is not a haughty imposition of form on material. Rather, it is a process of negotiation, in which the artisan must come to a personal knowledge, a partnership, with her materials. This cultivation of relationships is just one of the reasons that expertise requires practice, which is never just rote repetition. Practice allows the development of the student’s own expertise, a re-discovery and re-invention of the wisdom and knowledge of the teacher. A piece of stone for a mason is not perceived abstractly, but is understood in its flaws and strengths, its points of weakness and texture. These details are worked with by the expert craftsman. Materials offer opportunities and obstacles, they carry with them the story of their own past as well as of the (never shapeless) potential future which must be appreciated for the crafting to be successful. Sennett notes the personal relationship with materials typically extends to anthropomorphism – bricks can be honest, cloth obstinate, a musical instrument soulful. This fostering of relationships extends to the artisan’s own body, particularly the hands, to which Sennett devotes an entire chapter. The hands, being the primary means by which a work uses tools and instruments, by which they explore materials, effect changes and conduct the business of creation, are the crucible in which the experience of the craft is so often distilled. The hands are organs of perception as much as of action, and in writing in such terms Sennett’s pragmatism touches on enactive ways of thinking much as the works of James and Dewey so often do. Discussion of morality is conspicuously absent for most of the book, introduced at the end in the expectation that the value of work, of creation and craft is more clearly and simply illustrated without the explicit pronouncements and exhortations to place them at the centre of our conceptions of an ethical life. Sennett’s suggestion rings clearly in his discussions of apprenticeship and teaching, in his analysis of the personal, committed relationships that exist between craftsman and society, craftsman and materials and amongst experts within and between domains. Perhaps it is my own crass leanings that make me think Sennett’s “show, don’t tell” approach could have been a little more powerful had he succumbed to some more direct explication of his argument, perhaps in acknowledgement of the characteristics of the literary medium. Alongside this minor complaint, I would place a slightly more significant one, and that is Sennett’s lack of interest in the spread of individual differences in expertise – not just in capability, but in motivation to become skilled in the first place. He urges us to acknowledge the value of individual effort, but holds back from the complex mire of questions surrounding what distinguishes the development of expertise, the motivation to practice, to learn, to improve, that is immediately apparent to any teacher or parent. Certainly, I believe that the social and cultural context of activity plays a much greater role than many might care to admit, but genuinely individual differences should never lapse entirely from our attention. Hidden in the morass of complexity there is an understanding of what is quite so seductive about the easy life – despite its being so less satisfying. Why is the cheap, the simple, the disposable, so tempting? I would have hoped a full exploration of expertise might give us some hint, to show us the strengths and weaknesses of the phenomenon. And perhaps the answer is as simple as, practice is effortful, and we all have a tendency to laziness, but there’s something a little too trite about such a response. I feel Sennett had an opportunity to get into the question in some depth, but missed it. Ultimately, The Craftsman is a worthy book, and one that forms the first part of a proposed trilogy by Sennett in which his goal is nothing short of the exploration of the varieties of valued human experience, and lacking a foil or other scaffold it feels a little bit like that – a foundation rather than an edifice. There is still some important lessons to be learned from his warm and respectful exploration of expertise.